On the beautiful coastal town of Chernomorets is a place that must visit. Temple St. Nicholas is not like other churches. Sanctuary is a favorite abode for young and old. You cross the doors of the temple once will never forget this place. 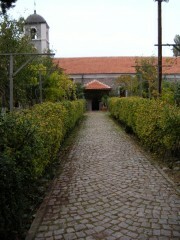 The yard of the church was turned into a real paradise. Every inch of this home to bizarre plants and their diversity is impressive. Lotus, orchids, swamp iris, lemon trees, kiwi, paradise apples are just some of the inhabitants of this enchanting place. And add to all this spectacular view of the beach and rocks. Fabulous, right? Local people say that the place was sacred centuries ago. According to the legend there was an ancient temple with a spring known for its healing water. Another legend associated with the temple, tells how a few centuries off the coast of the bay crashed Greek ship. Locals rescued shipwrecked, and one of the few surviving objects was the icon of Saint Nicholas - patron saint of sailors and fishermen. Traveling into Greek sailors left the sanctuary here, with gratitude and appreciation to the people who saved their lives. In - late in 1858 was built a temple named after the saint, where the icon was exposed for worship. In 1995, fire broke out in the temple, which destroyed almost the entire building, and one of the few surviving relics is again the saint's icon. A few years after the fire temple Saint Nicholas was restored with volunteer work and money of many Bulgarians, Smolyan craftsmen made ​​beautiful wood-carved iconostasis. Several years ago, was built and unique, beautiful chapel behind the main building of the temple, the place of the miraculous spring. St. Nicholas Temple is open every day for all Christians guests. Be sure to see it, it is worth!